Imagine waking up in the morning and taking a look out the window to see the sun rising. It is a beautiful day, but you can’t appreciate the view due to the filth on your windows. We have all been there before at some point in our lives. Maybe you try a temporary fix such as pulling down the blinds, however, if you put off window cleaning in Chicago for too long, your windows will become permanently damaged. The best way to get streak-free windows and protect your investment? Hiring our team of professional window cleaners who have served over 40,000 customers in the Chicagoland area. What Does Our “Window Cleaning” Service Include? Inside & Outside: When people think of professional window cleaning in Chicago, they often times only think of outdoors. Indoor windows collect dust that has built up inside your home, grease and steam from cooking, and fingerprints from curious children and pets. 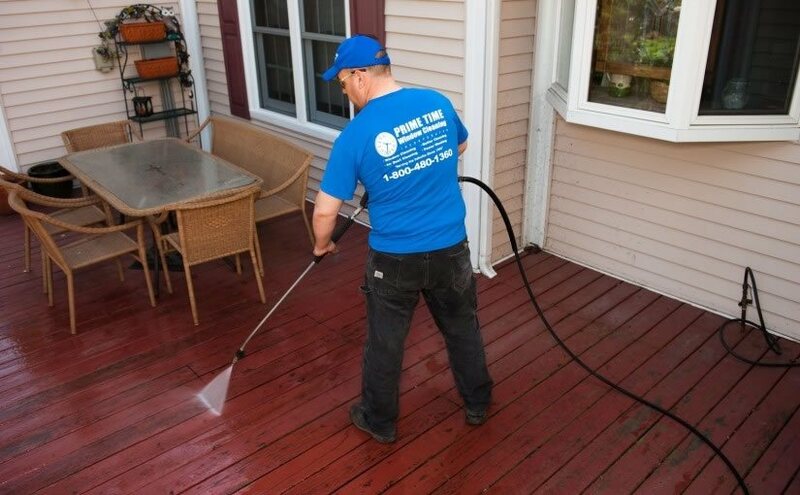 Professional outdoor cleaning is only part of the job. Storm Windows: Storm windows are mounted as additional windows, typically to the outside of your home’s primary windows. These windows are not replacement windows but are installed to achieve similar benefits at a lower cost. Storm windows offer increased energy efficiency, an improved exterior appearance, reduction of street noise and protection fro your primary windows. Cleaning storm windows can be a very tricky job, especially if the windows have aged and have not been removed in years. 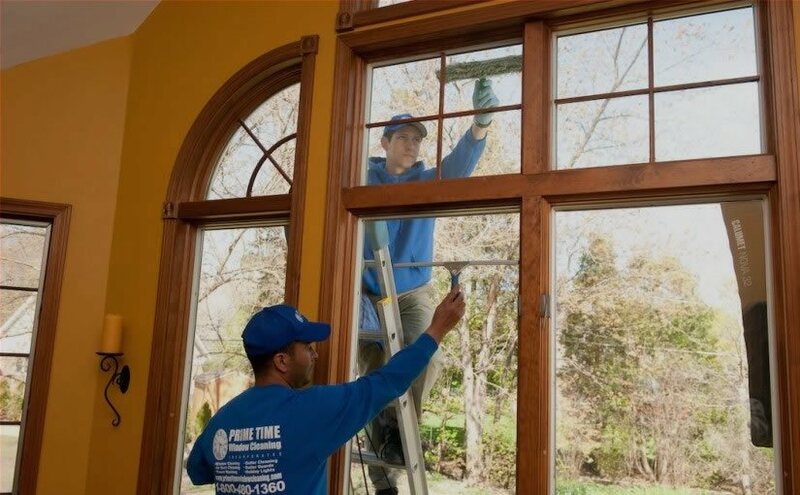 Here at Prime Time Window Cleaning, we understand the value of your storm windows and we will work diligently to clean them with proper care. Screens Cleaned: Maintaining clean window screens helps your screens to have a longer life and see outdoors with ease. Window screens should be cleaned at the beginning and end of every season. You may be amazed by how transparent your window screens can actually be after they have been properly cleaned by Prime Time Windows. Sill & Frames Cleaned: It is important that the window sills and frames do not get forgotten during cleaning. Over time, the tracks that your window slides along will become filled with dust and debris, making it difficult to open and close smoothly. Our professional window cleaners will remove dirt and build up from the tracks using a nylon brush. Excessive build up will need to be removed using a shop-vac. Skylight & Mirror Cleaned: Skylights should be cleaned at least once per year, though some skylights exposed to harsher weather conditions may require additional cleanings. A DIY skylight cleaning can get very dangerous for those who are inexperienced. Gutter Cleaning: Taking care of your gutters will not only improve curb value but also save you money by preventing future damage and repairs. Our technicians will hand clean your gutters by removing debris and taking with when they leave. Learn more about our gutter cleaning services here. Here at Prime Time Window Cleaning, Inc., our team of insured professionals can handle any size or type of property. We have served over 5,000 customers per year with high-quality work. We strive to leave every customer with a pleasant experience by using our services, from the time you schedule your appointment until the last window is cleaned. We guarantee our work to your satisfaction, or you don’t pay!